the large dna is 1.5 foot in the very huge clear ice. the clear ground. 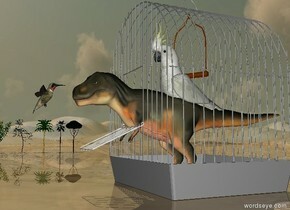 the dinosaur is 3 feet to the right of the ice. it is 13 feet in the ground. it is facing the ice. 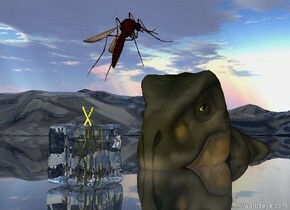 the enormous mosquito is 3 feet to the left of the ice cube. it is 2 feet in front of the ice cube. it is 2 feet above the ground. it is leaning backwards.